A often recurring requirement is a graphical inventory overview showing the usage of locations. There are many ways how to implement such a solution. 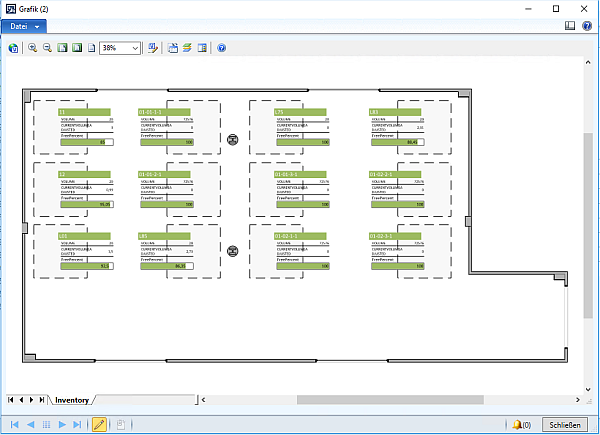 One simple way is to use data shapes in Visio and link them to Dynamics Ax data. 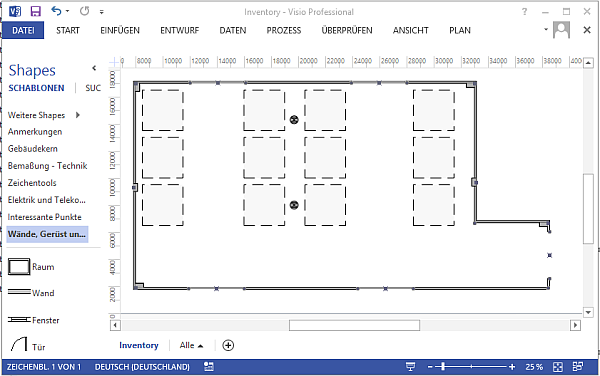 Since every warehouse is different, you have to create a separate Visio drawing for each one. Visio provides you with good standard shapes to draw a floor plan. In this example I am using a simple drawing of a warehouse with one door and 12 locations. 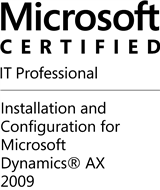 In my example a square in Visio represents a WMSLocation in Dynamics AX. Create one Visio file per warehouse and save it on a file share. 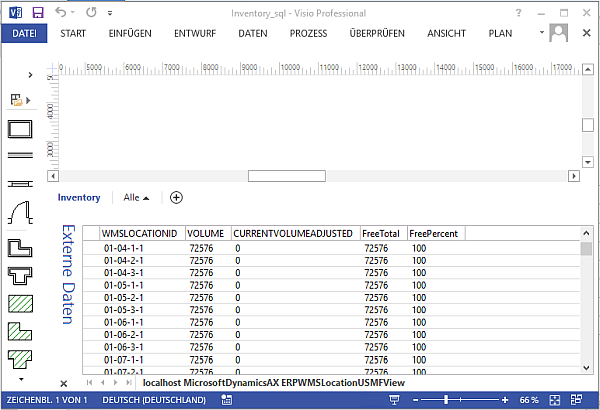 In the Visio main menu go to the Data tab and Link Data with Shapes. Go through the wizard and connect to your SQL Server and the view you have just created. This will open the External Data window showing the results from the SQL query. 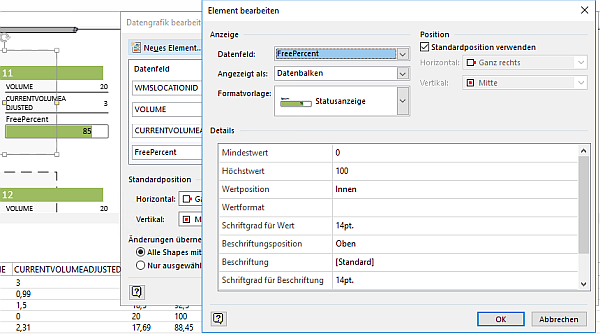 In the Visio drawing panel select the first square that represents a location. Right click on a record in the external data grid and select Link to selected shape. A chain symbol will appear next to the record, showing you that this record is new linked to a shape in your drawing. Right click on the shape that is now linked to a record in the external data. In the shapes context menu go to shape data and open edit data graphic. Here you can add and format the column values from the record to the shape. In my case I’ve formatted the InventLocationId as Header and the FreePercent as progress bar. Once you have formatted one shape you can copy & paste it multiple times. You only need to selected the copy and then right click on the corresponding row in the external data and link to shape. This will update the shape data with the values from the new record. 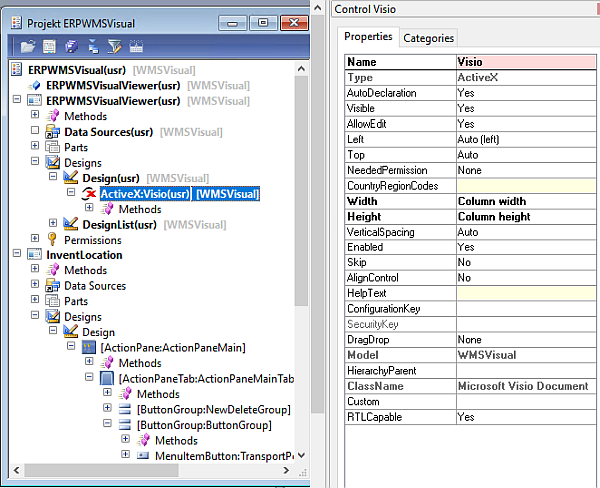 Finally some work is needed in Dynamics AX to view the Visio drawing. At the InventLocation table add a new field using the FileName extended data type. Add the field in the InventLocation form, so you can provide a Visio file path for each InventLocation. Create a new form and add an ActiveX control. 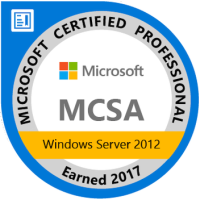 Use the Microsoft Visio Document class. 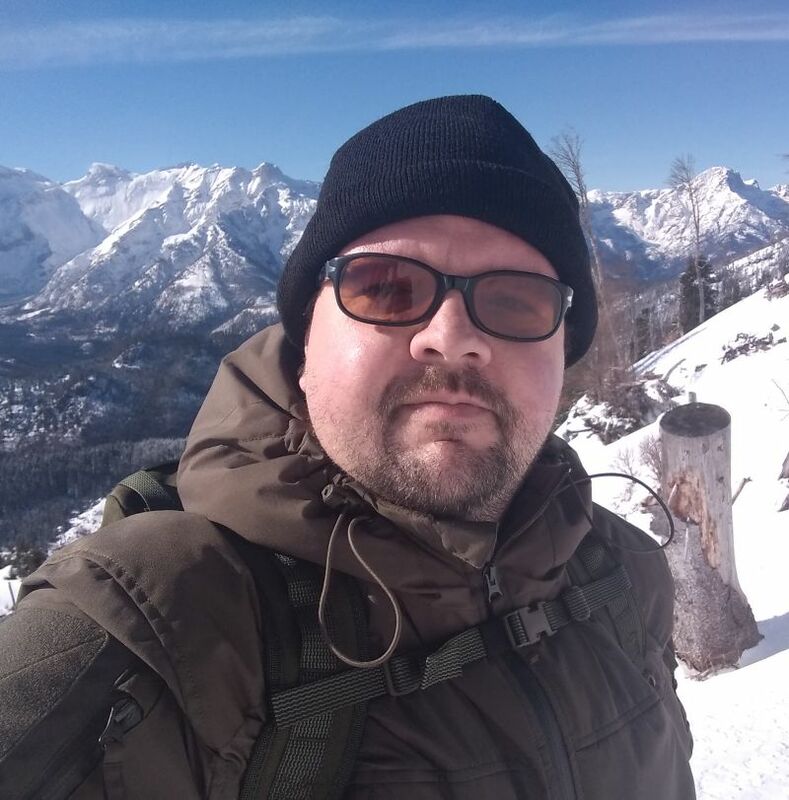 Overwrite the init() method of the form to load the Visio document. Create a display menu item for the form and add it to the InventLocation form. Make sure to set the InventLocation as data source for the menu item. 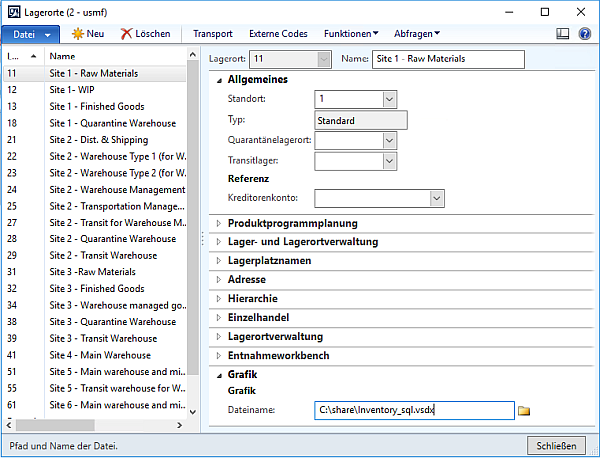 Now if you have created a Visio document and provided the file path in the InventLocation record, by clicking on the menu item you can see a graphical representation of your warehouse.